Visiting Yosemite National Park? Check out this guide. 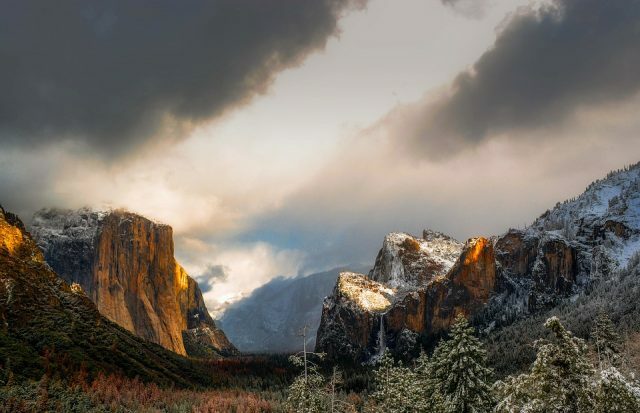 Unless you are unfamiliar with U.S. history and territories, you probably already know that Yosemite National Park has a monumental reputation. Most Americans have seen photos of the majestic granite domes that rise like massive sentinels over the river that is thousands of feet below. It’s easy to imagine what it would feel like to stand in the meadows below and gaze up at continental sheets of granite weathered into soaring grey domes. However, let me tell you from experience that the reality is so much more impressive than the pictures. Not only is it more breathtakingly massive, but it is also more capable of powerful silence, more full of thriving natural life. They say there is a radiant energy in Yosemite that captures all who set foot in the Valley. However, I’ve never been one to believe that sort of thing. But I finally drove into Yosemite Valley for the first time. I don’t know much about vibrations, chakras, or spirituality, but I know that I felt it before I even stepped out of the car. At once I knew that Yosemite National Park is a place where I’ll be spending much, much more time in the years to come. I also knew that everyone should have the chance to come here at least once and feel the power of this place. Yosemite National Park was actually the first national park designated by the federal government as protected land just for the purpose of conservation and tourism. Although it wasn’t awarded official National Park status until after Yellowstone, Yosemite’s land grant laid the groundwork for what would become the defining principles of the National Parks. 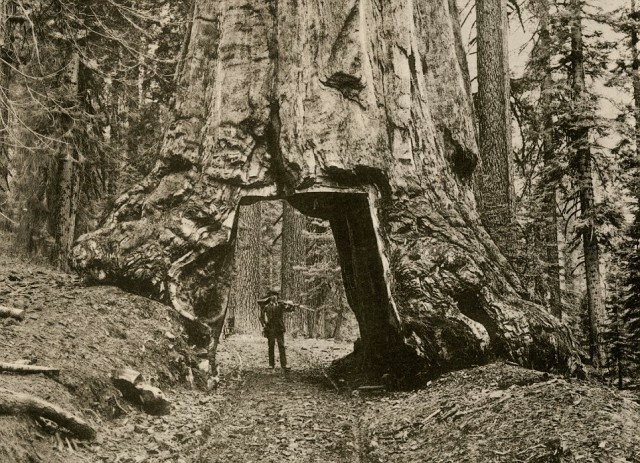 “Wawona,” a giant sequoia in Yosemite’s Mariposa Grove, California, circa 1890. 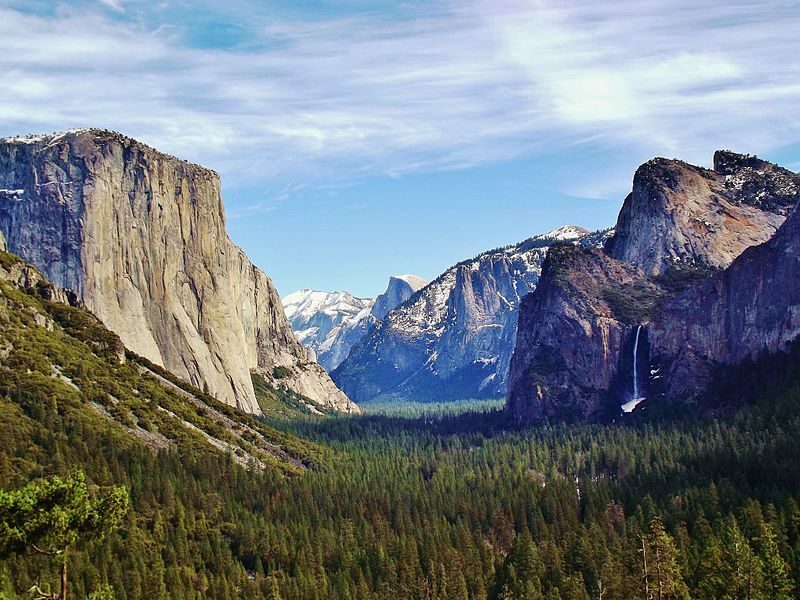 However, a lot had already happened in Yosemite Valley before the 1864 land grant. The Ahwahnechee tribe had been inhabiting the area for thousands of years prior to settlement. In the century leading up to Yosemite’s designation as protected land, there were numerous conflicts between settling business owners and the native tribe. By the late 1800s, conflict had been largely resolved, and new construction and development were well underway. It was in 1903 that John Muir famously took a trip through the Yosemite wilderness with then-president Theodore Roosevelt. It was reported that this time spent together moved Roosevelt to officially designate Yosemite as a National Park. Yosemite is a veritable playground for nature lovers of all sorts. Whether you come for the rocks, the river, or the remote hiking, you’ll stay busy without much trouble. In fact, there’s so much to do here, you might benefit from doing a little extra planning before you arrive. Otherwise, you’re liable to spend all your time looking at maps and reading guidebooks. That’s true if you’re a hiker, and even more true if you’re a climber. After all, even though there’s an awful lot of hiking in Yosemite, there’s even more climbing and it’s world class. In fact, Yosemite is probably the most famous climbing area in the world. 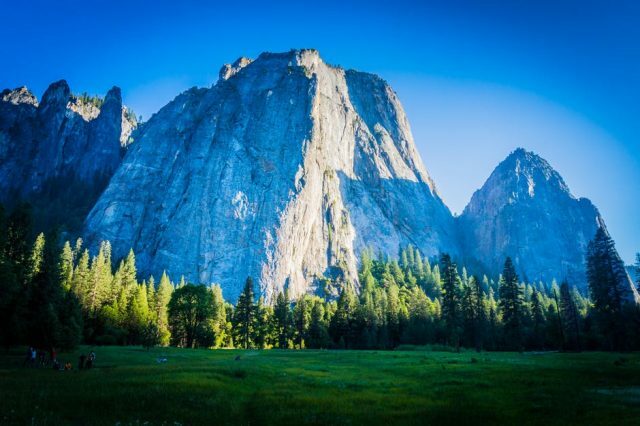 Many credit the Valley with being the birthplace of modern rock climbing, and it has been home to some of climbing’s most infamous ascents and famous partnerships. Although most come to the park just to hike or climb, there are a number of good trails for mountain biking in the area, rivers for rafting and kayaking, and you’ll even see the occasional rebel base jumper. Jumping is prohibited in the park, but that doesn’t stop some of the more dedicated divers that visit. The Valley has two villages that offer accommodation, food, and basic services. Yosemite Village, the site of the first concession in the Valley, Degnan’s Deli, is first along the road when you enter. 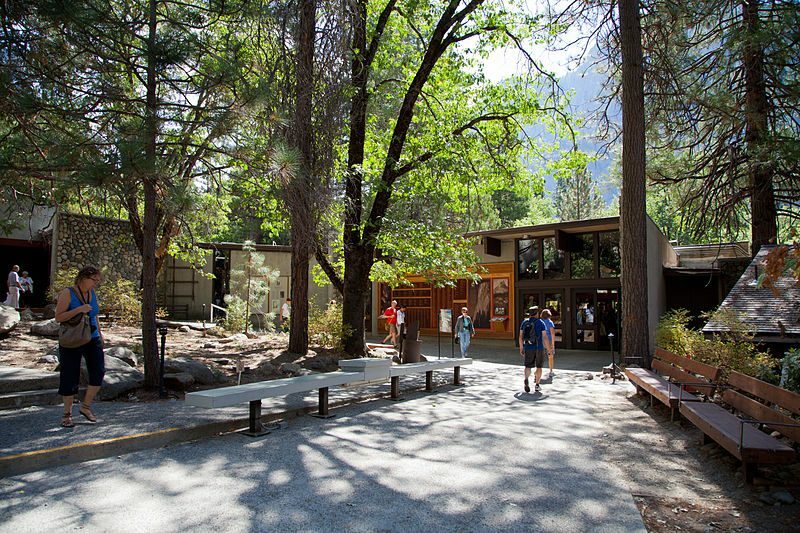 There you’ll find the Valley Store and the visitor center, as well as the Yosemite Valley Lodge and a few restaurants. Yosemite Village is also where you’ll find the post office, the Ansel Adams Gallery, the wilderness center, and the library. Yosemite Village is a quaint mixture of new and old. 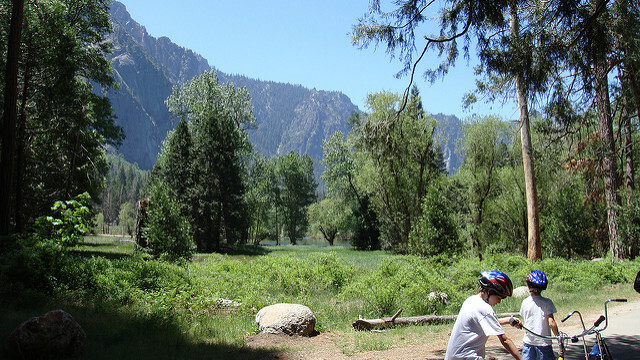 The Yosemite Village is close to El Capitan, Yosemite Falls, and the infamous Camp 4. Half Dome Village, formerly known as Curry Village, is further into the Valley and closer to Half Dome, as the name would suggest. Nearby you’ll find the famous Ahwahnee Hotel, now known as The Majestic. In Half Dome Village proper, you’ll find restaurants like the pizza deck next to the bar. Inside the Pavilion they serve cafeteria-style breakfast and dinner. You’ll also find the Coffee Corner (they also have ice cream). Out front, there are bike rentals, as well as the Greyhound bus terminal and a number of campgrounds. One of the most unique things about Yosemite Valley is how accessible it is. It’s the only place in the world where you can access massive granite formations so close to your car. Being able to climb a 3,000-foot wall of rock in the morning and then stop by the pizza deck for slices and beer right after is pretty spectacular. Best of all, you don’t need to climb the wall to enjoy the food. Yosemite isn’t so developed that it feels urban or tamed, yet there’s enough variety that you can pretty much always find something good to eat, no matter your mood. Pizza deck is pretty popular, obviously. And it’s pretty good pizza. I wouldn’t write home about it, but nothing beats a pie after a long day of hiking in the mountains. Spending $20 for a large isn’t cheap, but it’s not bad for being, really, in the middle of nowhere. Right next door is the bar. The beers are big, so don’t worry too much about the price. The staff is usually a pretty interesting crowd to chat with, too. The Grill is just around the corner where you can get burgers, fries, and shakes. The food served at mealtimes inside The Pavilion is pretty good, too, even though it’s cafeteria-style. Over in Yosemite Village, Degnan’s offers a cafeteria-style service oriented toward to-go food more than The Pavilion in Half Dome Village. It is a great place to go pick up food to take with you on the trail. Next door is the other Village Grill. And of course, most famously, you could go out to eat at the Ahwahnee Hotel, which is probably the best plates of food in Yosemite, even if they cost a little extra. 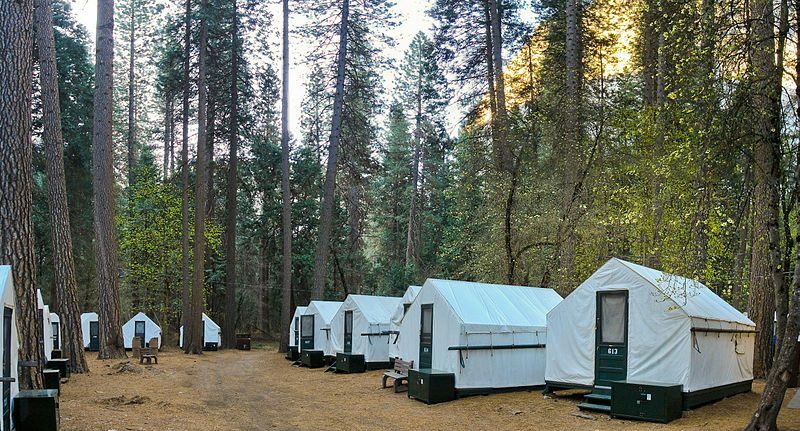 Semi-permanent tents in Half Dome Village. As a climber, I have known about Yosemite’s legendary Camp 4 for years. But there also are a number of other campgrounds all throughout The Valley. The one thing they all have in common is they’re full pretty much every day during the high season, and even for some of the low season. If you’re a climber and you want to get a space in the infamous Camp 4, you’re going to need to bundle up well and go wait in line at about 4 a.m. in order to reserve a spot for the following day. It is easiest to get a spot on a Monday once the park has cleared out for the weekend. I’m not personally familiar with the other campgrounds in the park, but they also tend to fill quickly. 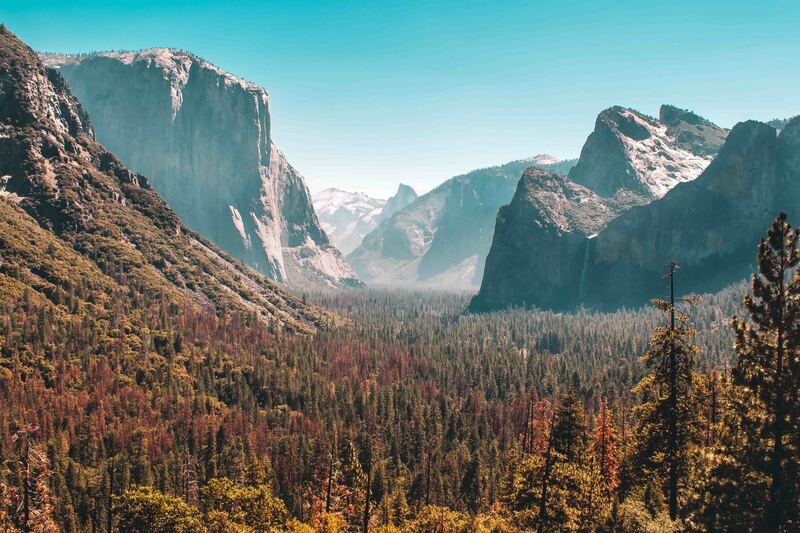 Undoubtedly, the reason most visitors come to Yosemite National Park is to hike the beautiful trails and take photos of the natural wonders of the park. 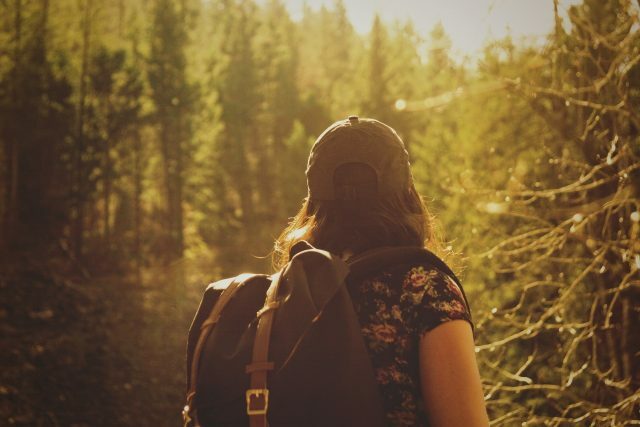 No matter your fitness, skill, or preparedness, there’s a hike for you here. Whether you’re looking for a multi-day backpacking trip, a short day hike, or just a short walk from the car, it’s here. 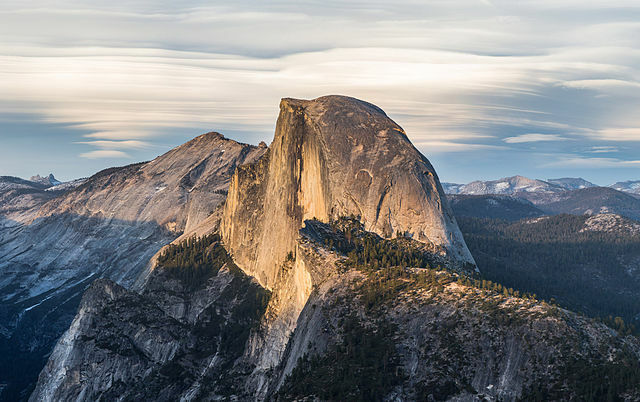 The most popular hike in Yosemite ascends the back of Half Dome. It’s not for the faint of heart. The most famous hike in Yosemite is undoubtedly the Half Dome cable route that ascends the 2,000-foot formation from behind up a steep granite ramp. For safety, you hold onto cable handrails. However, the hike is strenuous and dangerous, and accidents do happen. Eight hikers have died since the trail’s inception on the steep final section of cable climbing. If you hope to hike to the top of Half Dome, you’ll need a permit issued by the parks service. However, if you don’t want to go to the top, the mist trail that leads to the base of the cable route is beautiful in its own right. Winding up the valley past three incredible waterfalls, the trail gets its name from the cool misty breezes hikers are rewarded with at each set of falls. The mist trail is steep and strenuous, and should only be attempted by prepared parties who are physically fit. Hiking is the best way to see The Valley for most. The John Muir trail leaves Yosemite Valley in the same direction and winds for miles and miles up into the Tuolumne highlands and beyond. This offers incredible vistas, peaceful solitary nights, and access to some of the most incredible granite domes in the world. If you’re looking for something easier, the valley floor is crisscrossed with cool trails that wind back and forth through meadows and over the river. The short walk to Lower Yosemite Falls is easy for pretty much anyone and affords you an up-close view of the tallest waterfall in the continental United States. Or take the Mirror Lake Trail, which offers a short, moderate hike out to one of the most majestic spots in the whole valley. That’s barely a scratch on the surface of all the incredible hiking to be found in Yosemite National Park. I’ll have to write a whole other article to cover the truly expansive nature of Yosemite hiking. If you’re coming to climb, you’ll need to do a lot more research. It’s not just that there’s so much climbing to be done here, but that so much of it is so tall and so storied that there are guidebooks upon guidebooks of information to be learned. There’s an unending stream of beta on the internet. And of course, there’s all the information you’ll hear once you’re actually here in the park. Now, I’m obviously not going to write a rock climbing guidebook here, but let’s at least cover some of the basics. Everyone who visits Yosemite should have a sense of the history of rock climbing in the park as it is truly mind-blowing to conceive of as you stand below the towering granite walls. Yosemite National Park was in many ways the birthplace of modern rock climbing. The first technical ascents were put up in the area in the early 1900s. The first was actually made by John Muir himself on Sentinel Peak. However, it was in the ’60s when Yosemite climbing really took on a new form and dimension. Although the names are many and the legends are beyond count, Royal Robbins and Warren Harding bare mentioning. Although the two were infamous rivals, between them they were responsible for the first ascents of both Half Dome and El Capitan. First, Royal Robbins ascended Half Dome in five days with a team of three in 1957. Then Warren Harding, determined to one-up them, ascended El Capitan via The Nose Route the following year. To this day, The Nose is probably rock climbing’s most iconic route. The climb took Harding and his partners 47 days of climbing across the span of 16 months (they left their ropes up on the wall when they came down). 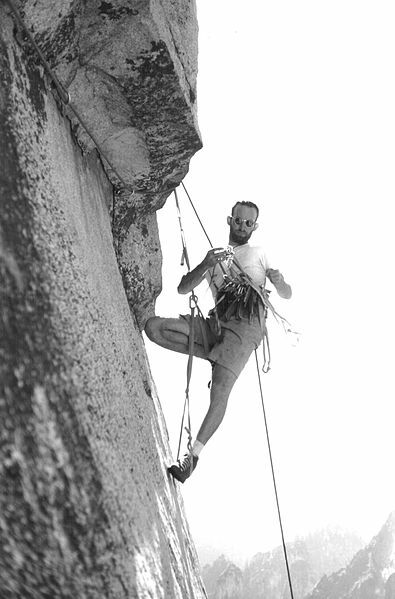 Three months later, Royal Robbins ascended El Capitan via the Salathe Wall in just six days. All of these climbs were done using gear to assist in gaining upward progress. The Nose route follows the sunshade line right up the center of El Capitan’s most prominent feature. However, in 1993, Lynn Hill became the first person to free climb The Nose, meaning ascend it without the help of gear and only using ropes to catch a potential fall. Then, the next year, she returned and climbed the route free in a single day. Just days ago (in June 2018) Alex Honnold and Tommy Caldwell broke the speed-climbing record on The Nose. The route that took Harding 16 months and 47 days of climbing took the pair just 2 hours and 10 minutes almost exactly 60 years later. Perhaps most famous of all, in 2017, Alex Honnold became the first and only person to ever free solo El Capitan. 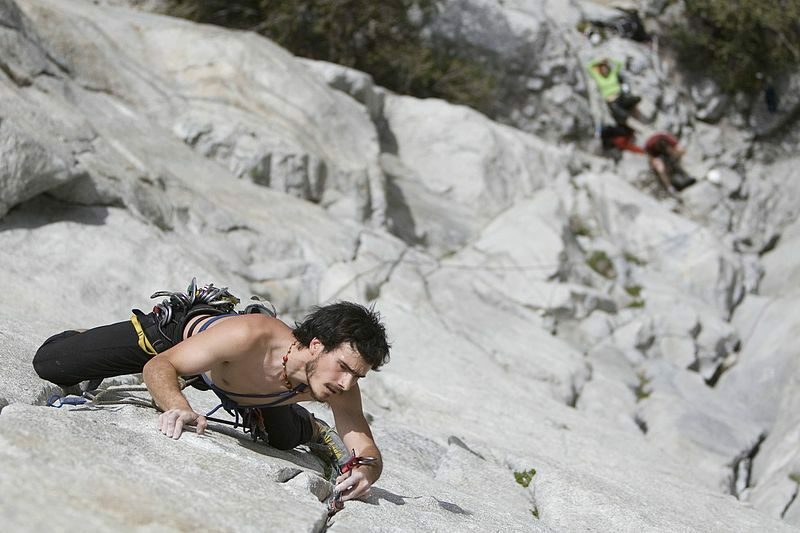 Free soloing means climbing without ropes or protective gear of any sort. His ascent shattered the perceived limits and set a new standard for what is possible. Today, climbing in the Valley is different for everyone. Most just come here to stand in the footprints of the greats. But Yosemite has and always will be a place where their tracks are easy to find. If you’re going to visit Yosemite National Park, you’re going to run into bears. Even if you don’t see one, it’ll see you. It will smell your food, and it might just come to investigate. 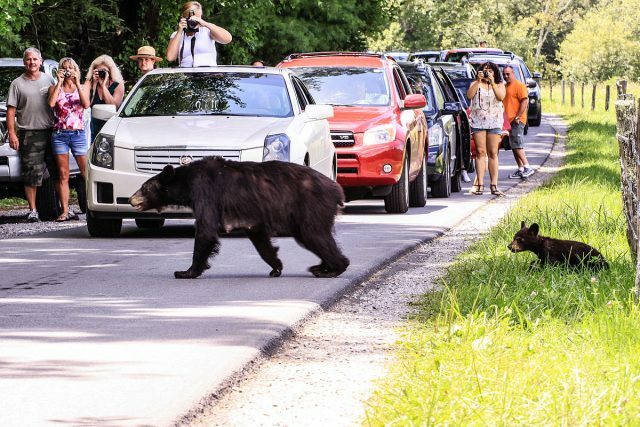 For years, the park has had trouble with bears breaking into cars, camps, and coolers to raid people’s food. A ranger recently told me that at the height of the bear problem a number of years ago, more than 70 cars were broken into by bears in a single night. Bears change from a wonder of the wild to a dangerous nuisance when they come too near to civilization. So that’s why the park is very strict about food storage and bear awareness. Cabins, camps, and houses are all outfitted with bear boxes for food storage and bear-proof trash cans. Signs all over the park remind tourists to be aware and careful. The bears in Yosemite National Park are all black bears (even though they can be colored brown) and are far less dangerous than grizzly bears. However, a startled black bear can be a big threat to hikers caught off guard. Most commonly, bear problems arise from improper food storage or from startling one on the trail by coming around a bend. It’s a good idea to travel in groups and make enough noise as you hike that bears can hear you with enough time to get off the trail and pass you by. Black bears aren’t aggressive, but they can startle. 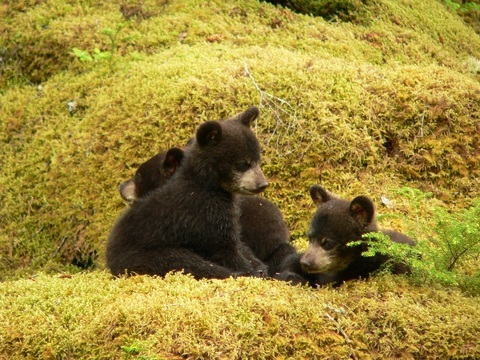 Black bear cubs emerging in springtime. The spring is the most dangerous time in bear country. That’s because bears are emerging from their pseudo-hibernation and are hungry. This often brings them into close contact with humans. Not only are bears hungrier during the spring, but cubs also are emerging from dens for the first time with mom. That means there’s a greater risk of coming between a mother and its cub, which is by far the most common cause of serious attacks by black bears. If you’re curious to learn more about bear behavior and myths, check out this article. Hands down, the best way to spend lots of time in Yosemite National Park is to get a job here. 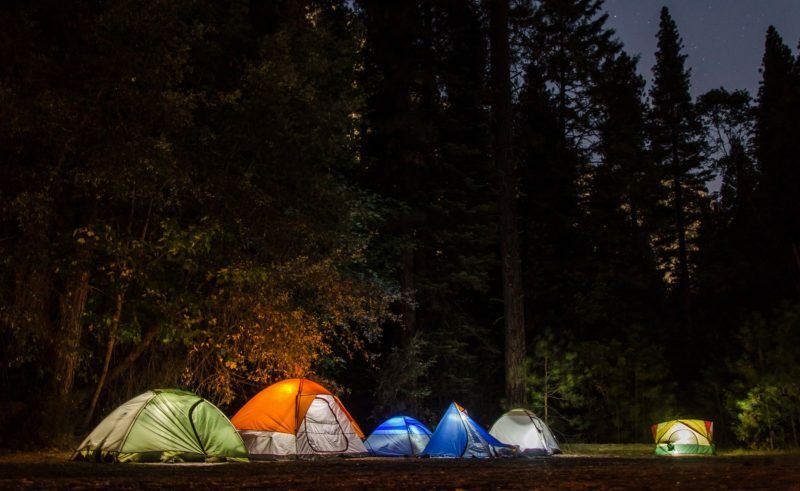 It allows you to forgo the strict camping limit of 7 days in Yosemite Valley. Plus, you get discounted food, cheap housing, and a vibrant community of adventurers, climbers, and randoms that wound up there. Working in Yosemite National Park can be a life-changing experience. There are all sorts of jobs to be found in The Valley if you aspire to spend an entire season here. You can lifeguard at the pool or flip burgers at the grill. Serve coffee in the morning or bus tables in the evening. You can work with tour agencies or conservation groups. If you’re a highly experienced climber or hiker, you can even volunteer or work for YOSAR (Yosemite search and rescue), which is not only an adventurous way to earn your stay in The Valley, but also a highly respected position of authority in the community. And you save lives. Yosemite National Park is managed now by Aramark and virtually all in-park employment is through them. You can go online to see a list of current job postings in Yosemite National Park (in Fresno, California). Although there is technically not a minimum time requirement, my understanding is that three months is the minimum stay if you hope to come back the following year. Camping in Yosemite is crowded and highly regulated. Now, you may be thinking one season will be enough for you and you’ll be ready for something new. But let me be the first one to warn you, that’s probably not how it’s going to pan out. You could spend a lifetime here and only scratch the surface of the hiking, climbing, and adventuring to be had in Yosemite National Park. So do yourself a favor and plan to keep coming back year after year. Yosemite will be right there waiting for you. If you have a good story to tell or blog, let us know about it on our FB page. We’re also happy for article or review submissions, we’d love to hear from you.